Description: Bring a main dish, side dish or dessert to share. Description: Come and join the women of St. John's for breakfast, fellowship and a presentation on the Oils of the Bible. Bring a friend. Description: Come and sit in the presence of Christ. All adults welcome! Faith Formation classes will have a chance to experience Adoration during their class time tonight. Description: Family Faith Night-all invited to pray the Stations of the Cross, led by our High School Youth Ministry. No Faith Formation Classes will be held tonight. Bring a main dish, side dish or dessert to share. 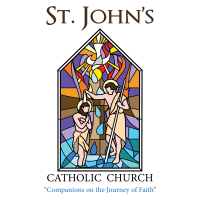 Come and join the women of St. John's for breakfast, fellowship and a presentation on the Oils of the Bible. Bring a friend. Come and sit in the presence of Christ. All adults welcome! Faith Formation classes will have a chance to experience Adoration during their class time tonight. Family Faith Night-all invited to pray the Stations of the Cross, led by our High School Youth Ministry.